Whether talking with other Doodle owners or surfing the web, I did quite a bit of research before I fell in love with Highview. 1. It was easy to get in touch with Wendy. 2. When I spoke to her on the phone Wendy was polite and very professional. 3. She responded to my emails and phone calls promptly while I anxiously waited for my pup to be born. 4. She called me right away when the pups were born. 5. When Wendy described our litter's birth, I was truly touched by the devotion and love with which she spoke. She was with Zari (Frida's mom) helping deliver each and every one of those puppies. I was amazed at how involved Wendy was in the delivery and well being of my puppy, her siblings and her mother. 6. She made herself fully available for us to visit the pups. She welcomed as many visits as we wanted. 7. When we got to Highview, Wendy made us take off our shoes! Her house was impeccably CLEAN so I completely understood why...but she made us remove our shoes because she didn't want us brining any contaminants downstairs to the pups. IT WAS ALL ABOUT THOSE PUPPIES! 8. The pups and their moms (there were 2 litters) were tucked away in a wonderful space downstairs in an immaculate and completely finished basement. BEFORE WE COULD EVEN TOUCH THOSE PUPPIES WENDY ASKED US TO DISINFECT OUR HANDS! 9. She handed each of us a pup. WE WERE IN HEAVEN. Wendy never once rushed us. She seemed thoroughly pleased that we were enjoying the pups as much as she herself does. She was checking US out too. I knew that if she didn't think we we're right for her puppy, then she wouldn't let us take one home. 10. Once we were home with our new little angel, Wendy was just a phone call away. I spoke to her on many occasions with questions or concerns. Wendy was always there for us. She is caring and truly a beautiful person. Who wouldn't want their pup to come from a home like this? Thanks for the birthday greetings. Bailey is doing great. He's 70 lbs, very sweet and friendly, and pretty mellow for a young dog. We take him to a dog park every morning and he loves to wrestle around with his buddies there. There's a black goldendoodle in the neighborhood from the Muellers and they really enjoy playing together. We couldn't have asked for a better temperament for him. He's great with people and other dogs. His coat started out wavy but since we cut his hair, it has curled up quite a bit. He has never shed. His only flaws are jumping up (which we have been working on and he's improved quite a bit). Also, he licks my family too much, but we are working on that as well. I just read the Dog Listener and thought it was very good. Just wanting to let you know that Brady is everthing you said he would be. You made our experience at getting a wonderful puppy very easy. Your facilitly it immaculate and the information that you shared with us about Goldendoodles has been very helpful along with the few times I had to call you were right there for support. 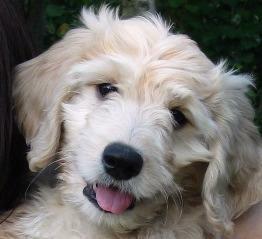 I have reccommended Highview Goldendoodles to a number of people with great pride. Thank you again for an amazing dog. He is a very special part of our family.